Ellen Barkin Before And After Plastic Surgery? 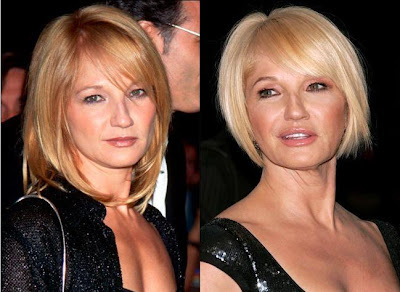 Ellen Barkin before and after plastic surgery, lip injections? Ellen Barkin is a lovely and talented longtime hollywood actress, known for starring in motion pictures including Sea of Love, This Boy's Life and Drop Dead Gorgeous, just to name a few. I think it's dangerous. Women who have had major surgery are sending out the signal saying, 'I'm not happy with where I am, so I want to be somewhere else, I want to be like I was at 30. I think face lifts make you look older not younger. You look at them and think either they look crazy or awful. For some of them, I will say, 'Oh, wow! That looks like a beautiful woman (but) it just doesn't look like the same beautiful woman. However when it comes to non-invasive procedures, Ellen has readily admitted to undergoing collagen enhancing treatments such as Thermage and Fraxel. I don't have problems with fillers and non-invasive procedures. I think a little bit of everything is OK, I'm fine with it all except Botox. The whole Botox craze, what it says to me is 'I am desperately unhappy with where I am in my life's journey, I don't like it, I want to disguise it, I want to erase it. Like, 'I'm not comfortable being 30, 40, 50, 60.' And I have issues with that. She even took it one step further and voiced her displeasure for observing actors who have undergone too much plastic surgery. I don't want to see someone I've watched in movies for 20 years and not know who they are, with their eyebrows somewhere in the middle of their hairline. If I see someone on screen whose face can't move to express emotion, then I'm no longer interested in watching them act. One thing that Ellen fails to mention is her thoughts about lip injections, however from the looks of this track-record of before and after photos, it would appear shes not appose to the idea. I must admit, its quite admirable of Ellen Barkin to voice her opinion about plastic surgery, considering how popular this trend has become among many of her peers in show business. However i imagine the feeling is somewhat mutual among fellow celebrities, who recognize the alarming rate of plastic people. Ellen Barkin is a gorgeous woman. Always has been. Hers looks subtle and believable. I like it. Ellen Barkin still looks great. you need some help with your spelling. it's OPPOSED not appose! She is not appose? Find an editor, please!